Son of physician Sir Charles Henry McComb. Learned in childhood out of "either natural curiosity or instinct to deceive!". Amateur in 1940s as "Innis More", "Callidus", and "The Great Liam". 1946 Cotswold Gold Cup. Qualified as a physician in 1949 but never practiced. 1949 British Ring Shield with partner June Cochrane (later with own act as "June Merlin") whom he married later that year. Pro stand-up and stage magician since 1949. Separated from wife in 1967 and moved to USA. 1977 AMA Visiting Magician of the Year. 1984 AMA Performing Fellowship. 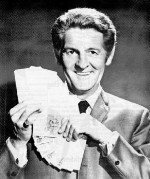 In 1984 became 1st living European magician elected to the SAM Hall of Fame. Member of the Board, Academy of Magical Arts, 1988-2006. 2000 Christopher Lifetime Achievement Award. Invented Hot Book (1945), Slow Cage Vanish (1945), Half-dyed Silk (1949), Double Sawing in Half (1960), McComb-ical Deck (1960), Banana Split (c1963), etc. Billy's approach requires a boldness which some may find rather disconcerting but, if you learn the routines and approach them confidently and assuredly, your hesitancy will soon disappear. Nothing has been kept out of this book. Here you will find the cream of Billy's own routines, each one polished to a thing of beauty by a great deal of study and thought, and then by repeated performance before the paying public. This is volume 7 of a seven volume series. The full routine for the Bill in Lemon effect. This is volume 6 of a seven volume series. The full routine for the Nap Hand effect. This is volume 4 of a seven volume series. Close Up Magic. This is volume 3 of a seven volume series. The Himber Ring Routine and Night Club Magic. This is volume 1 of a seven volume series. Get to know Billy. A general introduction to magic. My oh my is this a great ebook! If you intend to earn a living doing magic or if you simply want to make your performances more professional then do yourself a favor and read and study this ebook. There are decades of experience bottled up in its wisdom. And on top of this it is fun to read. This wonderful publication is subtitled: First lecture in England in Years. Illustrated by Ken de Courcy. McComb is at his best with a range of props from ropes, balls, egg-bags, cards, and more. 1st edition 1990; 20 pages. When you "Haven't Anything with YOU"